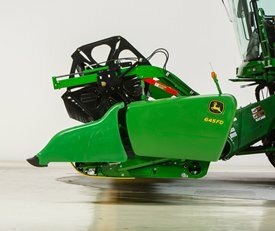 The TriStream rotor is unique to John Deere because it features a slightly tapered design in the threshing area for best in class grain quality while dramatically reducing the growling that often comes with heavy rotor loads. The TriStream rotor is recommended for producers who harvest mainly coarse grains along with easy threshing small grains. The spiral vanes surrounding the rotor, guide the crop material through the threshing and separating area in a pull and release affect to improve performance. 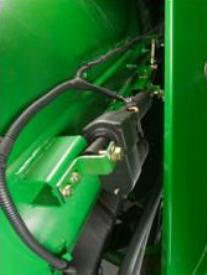 This John Deere S-Series Combine feature is going to generate less power consumption. TriStream rotor technology reduces the force required to move material through the combine by as much as 20 percent, maximizing fuel efficiency. The rifling grooves on the threshing elements allow the bullet-shaped rotor to move material more efficiently maximizing crop threshing performance and grain quality. Heavy-duty vanes on the top covers propel the crop smoothly rearward through the length of the rotor ensuring all the threshed grain is separated. Fifteen cast-constructed threshing elements provide superior material handling with excellent grain quality. The elements spiral around the rotor to control material flow. In some harvesting environments, the dense-pack configuration (nine additional threshing elements) may be necessary. Conical top covers allow for smooth material movement within the threshing and separating area. The top covers have a radius larger than the rotor, allowing the material to expand as it travels along the top of the rotor. 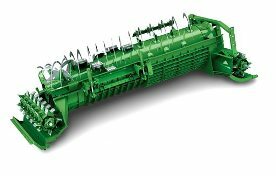 This design uses the pull and release action of crop material, aiding in the threshing and separating to reduce power consumption. The industry-exclusive ProDrive system uses PowerShift™ transmission technology to automatically shift between two speed ranges as ground conditions and terrain change, to keep the combine harvesting at the desired ground speed. Valuable harvest time will no longer be lost shifting on hills and when exiting fields to start transporting. The ProDrive system on S-Series Combines includes an integrated Harvest Smart™ feedrate control system to provide the maximum productivity and reduce operator stress and fatigue. The ProDrive hydrostatic motor has a higher displacement than the previous hydrostatic systems. Both the pump and motor are variable-displacement components that allow ProDrive to maintain high levels of torque to the ground throughout each of the two operating-speed ranges. Range one can be set for typical harvesting speeds. Range two can be used when higher speeds are needed during harvest or when transporting the combine. The ground speed can be infinitely varied within both modes by the operator, using the multifunction control handle on the CommandARM™ armrest console. The multifunction handle regulates the high-capacity, variable hydrostatic pump and motor that drives the ground speed. Using the navigation tools on the armrest, the operator can dial in the desired maximum-attainable speed within each of the two speed ranges. The maximum forward speed in either range can be set from 0 to 38.6 km/h (0 to 24 mph). The maximum speed in range one cannot be set higher than the maximum speed for range two. For example, if a maximum harvest speed of 13 km/h (8 mph) is desired and set, the full forward position of the hydrostatic control handle will deliver the speed of 13 km/h (8 mph). The ProDrive transmission is equipped with an electrohydraulic differential lock with a four-pinion differential. Non-ProDrive combines have a two-pinion differential. When operating in muddy, hilly terrain or in sandy conditions that may cause one of the tires to lose traction, this differential lock enables the operator to maintain productivity. 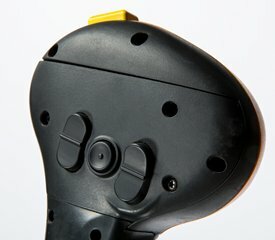 If traction is lost, the operator can quickly and easily engage the differential lock by pressing the differential lock button on the CommandARM armrest console. An indicator light within the button alerts the operator that the differential locking feature is engaged. The Harvest Smart system is an adaptive, on-the-go control system designed to enable automatic ground speed control during harvest operation. Harvest Smart ensures the combine maintains a consistent crop load (feedrate) by automatically changing the combine ground speed to compensate for variations in crop that are not readily visible to the operator. During the course of a long harvest day, operators are challenged to maintain the combine at peak performance due to varying crop conditions that affect the crop load entering the combine. The Harvest Smart system will adjust to changing conditions faster than an average operator, maintaining a consistent crop load into the combine. Since the Harvest Smart control system automatically keeps the machine at maximum load capacity, as set by the operator, fatigue and stress are reduced and overall harvesting productivity is increased. Smart mode monitors rotor pressure and loss level while maintaining operator established parameters (loss monitors must be calibrated). 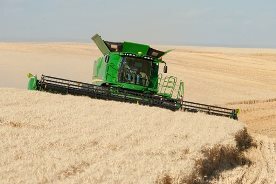 While harvesting with machine optimized at the operators acceptable loss level, the system is set when the calibration button on the grain loss screen is pressed. When loss monitor levels are consistently above or below operator desired levels, system increases or decreases material flow levels, bringing loss levels back into desired range. Smart mode is not an immediate or instant adjustment; the system will change ground speed while not exceeding the parameters established by the operator. Capacity mode maintains a constant material flow, allowing the machine to increase ground speed when crop materials are lighter and decrease ground speed when crop material is heavier. Capacity mode does not monitor the grain loss system since the mode is only maintaining a constant material flow. NOTE: Capacity mode should only be used when loss monitors are not reliable, such as when sensors are matting over with crop. Platform tilt is an option that allows growers to hydraulically adjust the fore-aft pitch of front-end equipment at the touch of a button from inside the cab to adapt to changing crop and field conditions. The platform tilt feature includes a different multi-function lever (hydro handle) to adjust the feederhouse tilt frame from the cab. Model year 2015 and newer S660, S670, S680, and S690 Combines provide an optional hydraulic header fore-aft tilt capability from the cab. However, all S-Series Combines include a front-tilting faceplate as standard equipment. This tilting faceplace allows static fore-aft adjustment of up to 17 degrees of tilt on the feederhouse to accommodate different header and tire combinations to ensure a parallel cutterbar to ground relationship. 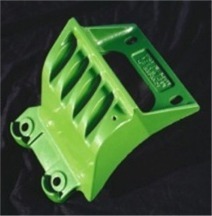 This prevents the cutterbar knife guards from bulldozing or the platform healing on the rear of the skid shoes. NOTE: Hydraulic fore-aft adjustment range is limited based upon the front-end equipment attached to prevent header frame damage. Check availability in local Price Pages. The industry-exclusive variable-stream rotor features a tapered design in the threshing section which improves crop flow, enhances grain quality, and reduces power consumption. The variable-stream rotor with adjustable top cover transport vanes is recommended for producers of rice and tough threshing conditions. The variable-stream rotor smoothens crop flow during tough handling conditions to maximize throughput. Along with the tough material handling capabilities of the variable-stream rotor configuration, the straw quality and length can be improved due to the electrically adjustable top cover transport vanes. The longer rotor taper in the threshing area allows improved material handling by providing smoother crop flow through the combine maximizing threshing performance and fuel efficiency. Electrically adjustable transport vanes allow operators to change the vane angle from the cab for improved straw quality. Fifteen, cast-constructed threshing elements provide superior handling, improved durability, serviceability and maintain excellent grain quality. The elements spiral around the rotor to move and control the material. In some harvesting conditions, 12 additional bolt-on threshing tines maybe installed for increased material handling. Rear discharge flights and a tapered rear cone improve material handoff to the rear discharge beater. Electrically adjustable transport vanes allow operators to change the vane angle within the cab. Longer straw length can be accomplished when vanes are in the advanced position.